The credit must go to Serena Padovani, a former director of the Galleria Palatina in Florence, for first suggesting that an exhibition be devoted to the work of Piero di Cosimo, a highly original and imaginative painter of the Florentine Renaissance and an outstanding teller of tales, yet whose reputation outside the narrow circles of art historians and collectors, has (quite unjustifiably) never managed to reach a par with those of his contemporaries Filippino Lippi and Fra’ Bartolomeo. That there was interest in the artist and that the theme was topical were confirmed by the fact that the National Gallery in Washington – one of the United States’ most important museums, with collections that include unquestioned masterpieces by such artists as Leonardo da Vinci and Vermeer – was also planning to mount a monographic exhibition devoted to Piero di Cosimo. This common goal gave rise to a joint project which led to two exhibitions being devised for 2015, the first of which, in the National Gallery in Washington, closed on 3 May. The two exhibitions are distinct events rather than two versions of a single exhibition. Even though some thirty or so pictures by Piero di Cosimo feature in both the National Gallery and the Uffizi exhibitions, they are in fact based on two different projects, with a narrower and more strictly monographical approach being adopted in Washington, and a broader approach – comprising roughly 100 works –characterising the Uffizi event, which also includes drawings by Piero di Cosimo as well as paintings and drawings by several of his contemporaries such as Filippino Lippi, Fra’ Bartolomeo and Lorenzo di Credi, whose work dialogues closely with that of Piero. One of the more important exhibits present only in the Uffizi exhibition is a panel depicting the Death of a Nymph from the National Gallery in London, a moving masterpiece whose subject matter is still shrouded in mystery and which has been stimulating other artists’ imagination since the 19th century. 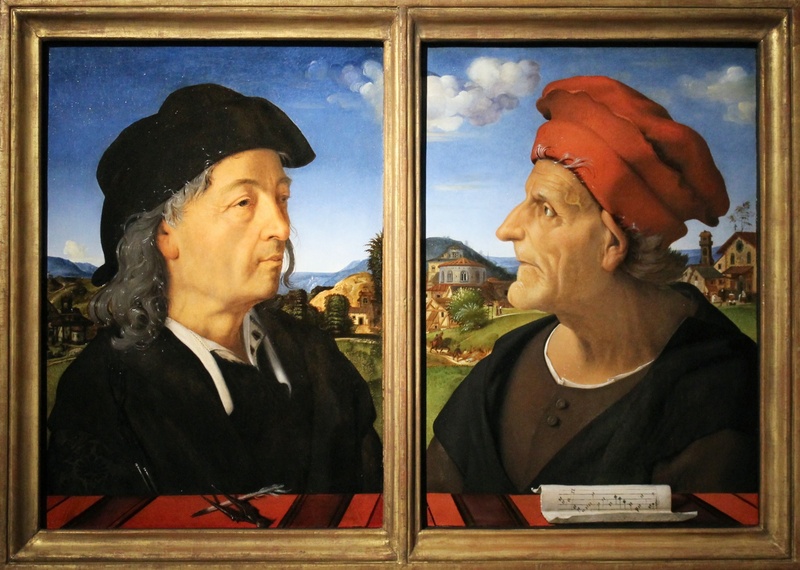 The Uffizi exhibition tracks Piero di Cosimo’s artistic career from his early days as an apprentice in the workshop of Cosimo Rosselli, the master responsible for the name with which he was to become known, given that his real name was Piero di Lorenzo. His crucial encounter with the art of Leonardo da Vinci and the Flemish painters stimulated his ability to observe nature and to marvel at the world around him in rapt delight, regularly transposing fragments of that enchanted world into his religious paintings where they take on a deeper symbolic significance. But tracking Piero di Cosimo’s work also means plunging into the history of Florence in the Renaissance, from the age of Lorenzo the Magnificent, when Piero produced works of such outstanding quality as the Visitation (Washington, National Gallery) for the chapel of Piero di Gino Capponi – the hero famous for his defence of the city against King Charles VIII of France – in the church of Santo Spirito, or the cycle with The Early History of Man that he painted for the Del Pugliese family palazzo. Of this cycle, the Uffizi exhibition hosts two Hunting scenes from the Metropolitan Musem in New York and the atmospheric view of a building under construction from the museum of Sarasota. The exhibition is curated, and the catalogue (published by Giunti Editore) edited by Serena Padovani, Elena Capretti (an expert on the 16th century and the author of various scholarly works on Piero di Cosimo), Anna Forlani Tempesti (an expert on drawings and a former director of the Uffizi’s Gabinetto Disegni e Stampe) and Daniela Parenti, director of the Department of Medieval and Early Renaissance Art in the Galleria degli Uffizi. The event is promoted by the Ministero dei beni e delle attività culturali e del turismo with the Segretariato regionale del Ministero dei Beni e delle Attività culturali e del turismo della Toscana, the Ex Soprintendenza Speciale per il Patrimonio Storico, Artistico ed Etnoantropologico e per il Polo Museale della città di Firenze, the Galleria degli Uffizi and Firenze Musei. Guided tours for school groups by appointment only.